On Sunday afternoon, a private conversation between Prime Minister Malcolm Turnbull and Tesla boss Elon Musk caught Australia's attention. It came after Mr Musk claimed he could solve an energy crisis engulfing South Australia within 100 days - or he would do it for free. South Australia has faced crippling blackouts in recent months, prompting intense discussion locally about how to fix them. Mr Turnbull and Mr Musk spoke on the phone for almost an hour. They tweeted about it afterwards. When Mr Turnbull took over as Australian leader in 2015, he famously promised to be more "agile" when it came technological innovation and industry. His conversation with Mr Musk was described as involving two people "picking each other's brains", according to one media report citing an unnamed source. It initially drew some humorous responses, with one financial commentator writing an in-jest take on how it might have unfolded. 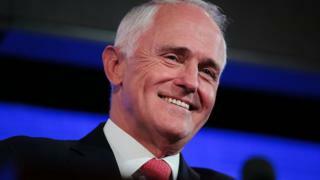 Others on social media likened it to Mr Turnbull's recent calls with Donald Trump - one where he obtained the US president's number from golfer Greg Norman, and a famously a robust conversation the pair had over a refugee deal. More details about the Mr Musk discussion were not divulged, but Mr Turnbull's office said: "The pair had an in-depth discussion on the value of storage and the future of the electricity system." However, by Monday the conversation was being described as "just general discussion" by Mr Turnbull's Resources Minister Matt Canavan. All 1.7 million people in South Australia - which is 40% bigger than Texas, covering more than 980,000 sq km (380,000 sq miles) - lost electricity following an extreme storm in September. Then in February, the state's residents were again warned to brace for crippling blackouts during a heatwave. Ultimately, 90 homes and businesses had power shut off for 45 minutes. The events have exposed significant issues with the state's ability to supply enough energy. A practice called load-shedding - shutting power off in periods of high demand - has been controversial. Bodies including the Australian Energy Market Operator and the Climate Council have warned the problem will get worse without intervention. It does not only affect South Australia - there is also concern for the nation's most populous states, New South Wales and Victoria. The federal and state governments are still deliberating over how to resolve the energy crisis. South Australia has become increasingly reliant on intermittent renewable sources - such as wind and solar - meaning supply is reduced when there is little wind or sun. This has led some to criticise renewables, but others maintain they are not just environmentally friendly but also cheaper to produce. Regardless, solutions under discussion include better links to interstate power, domestic gas production, coal and - as Mr Musk advocates - improved battery storage. Will Mr Musk really be involved? On Thursday, Tesla executive Lyndon Rive had said the company could install 100-300 megawatt hours of battery storage in 100 days. Mr Musk went on to quote a price of $250 per kilowatt hour for 100 megawatt hour systems. However Australia's relevant minster, Mr Canavan, on Monday appeared to downplay the conversation between Mr Turnbull and Mr Musk. "I think it's just discussions at this point, and I don't believe anything specific to South Australia was discussed, but we support all technologies," Mr Canavan told the Australian Broadcasting Corp.
"For a politician to stand up and say that 'I've got the solution, all we need is 100 megawatt of batteries' is fraught with danger," he said. South Australian Premier Jay Weatherill has also spoken to Mr Musk and will not rule out his seeking his help, but his government is expected to make a separate announcement later this week.